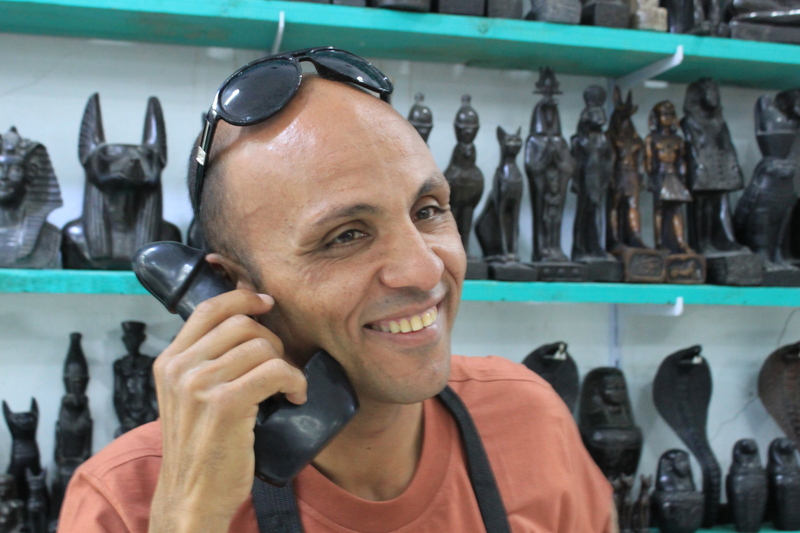 His name is Alaa al-Din, but he asks us to call him ‘Aladdin.’ My mother jokes that he must normally take the hearing-impaired around the Valley: he raises his voice, spaces his words, and repeats most phrases. He begins each sentence with ‘Excuse me’ to get your attention, and ends with an affable, mock-naive nod, or maybe a tap on the knee if you’re nearby. He has a slightly lazy eye, minor lisp, shaved head, skinny frame, and a laugh like a sputtering motor. “Excuse me, if you want to go to the extra sites, no problem. It will cost one hundred pounds, no problem… the extra sites, if you want to go… it will cost one hundred pounds. No problem.” He loves telling you about King Tut’s mishhapen head and makes fun of different nationalities with a knowing smirk. In short, totally worth it. Plus, it’s an inexpensive trip compared to the myriad other options for sightseeing in Luxor. Ask at your hotel and they should have his phone number.